With the latest update, we are pleased to announce the debut of Season 2: Chapter 2! In Season 2: Chapter 2, players will be introduced to an entirely new grunt faction the “Circle of Eight.” The Chapter Mastery reward for Chapter 2 is the Uncanny Cyclops uniform. The players have been asking for it, and we delivered! With the rollout of Season 2: Chapter 2, agents will now be able to increase their heroes’ levels by one, to a new max level of 13. Heroes who reach level 13 will also earn a new “Diamond Elite” PvP bonus. Training times and costs have also been adjusted. We are rolling out a whole new type of ISO in conjunction with Season 2: Chapter 2. Players will be able to socket these new ISO types in their heroes’ uniforms to change the passive effects any particular costume may have. 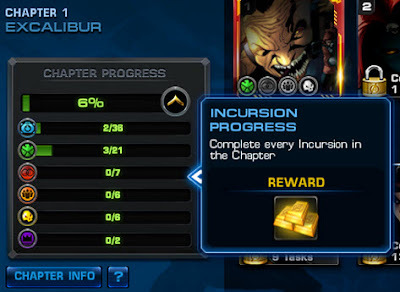 There will be new incursion battles throughout Season 2: Chapter 2, with the exception of mission 6, which will have 2 incursions. 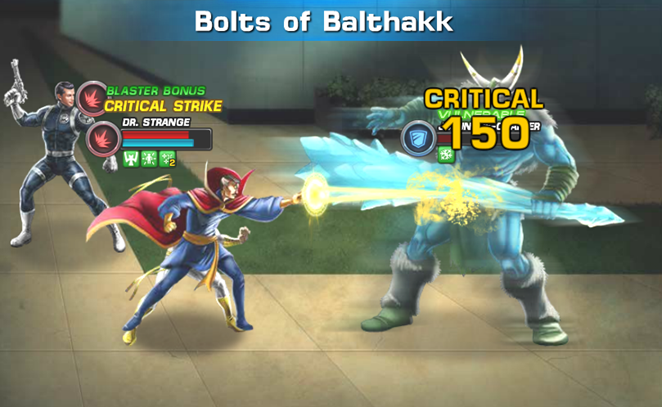 Several heroes who are featured in Heroic Battles do not have Character Restricted ISO-8 earnable in their Heroic Battles. These include Nightcrawler (Chapter 1), Iron Man (Chapter 2), and Wolverine (Chapter 2). 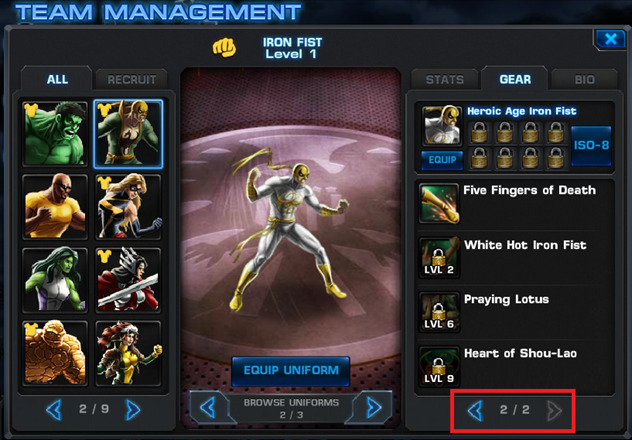 For now Wolverine’s Chapter 2 Heroic Battle features the same ISO-8 as his Chapter 1 battle. 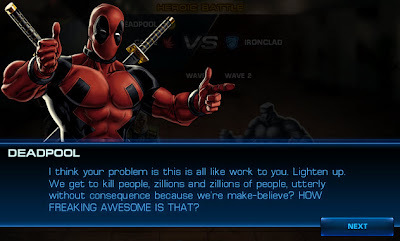 We hope to fix this when we release Moon Knight. Players have wanted this feature for a long time, and Season 2 finally gave us the avenue to get it done. 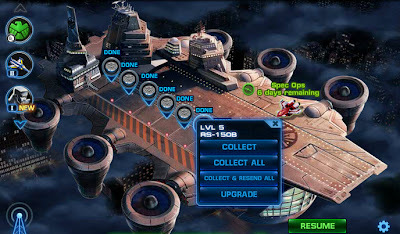 Simply speaking, when you click a “Done” flight deck dock, this option will present itself. If you click it, all “Done” jets will return and automatically send back the heroes they were holding for the same duration as their previous mission. We hope you’ve been enjoying these notes and our eagerness to share our thoughts and development process here at Playdom on the MAA team. Please let us know in the comments if you’d like updates like this for future content and we’ll see what we can do. This will be the last update to the Producer’s Notes for Season 2. I want to thank everyone on the team for working late hours and weekends to get this content ready for the world. Season 2 is really fun, and that’s due to the incredible passion our team has to make something really great. From the writing and the design, to the art and programming - everyone did an amazing job on this release and it shows. Most of all we’d like to thank our fans for being so patient while we finished up and added all the great features that make Season 2 a new and unique experience in the game. We know waiting is hard because we play the game too. 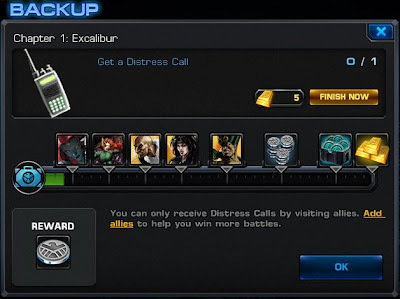 Today we’ll take a look at the update to the Research section of Marvel: Avengers Alliance. As you all know, research is incredibly difficult to navigate and find the things you are looking for. 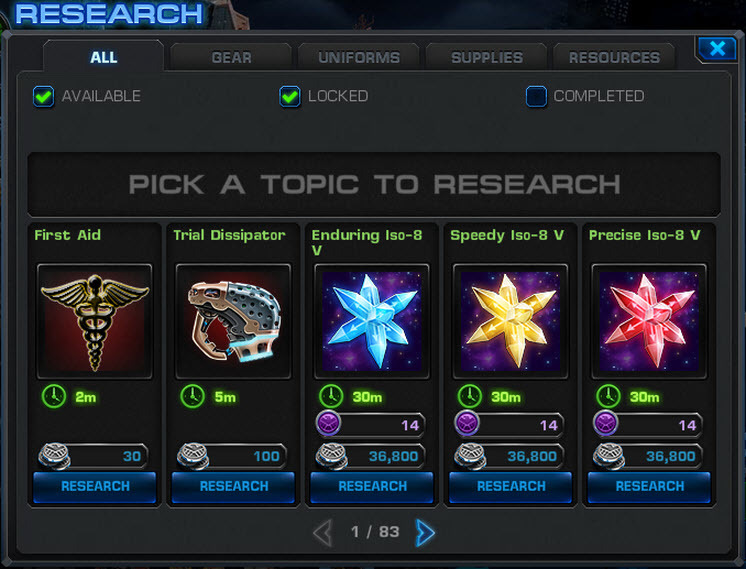 Today we’d like to announce that we’ve added a number of filters, as well as category tabs, to research. 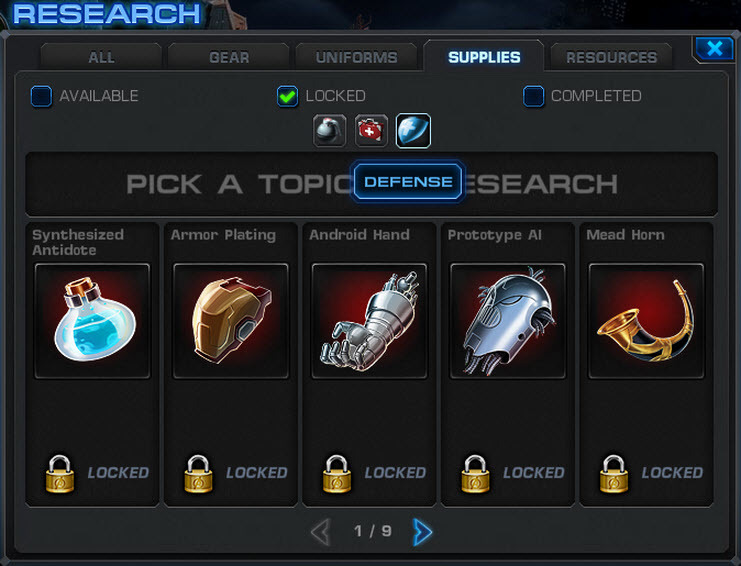 As you can see, there are 5 category tabs - All, Gear, Uniforms, Supplies, and Resources. Each has 3 common filters (show all Available, Locked, and Completed) that you may toggle on or off in any combination. Each also has unique filters. We’ll look at each of those below. On the gear tab you can sort by Ranged, Melee, or Gadget. On the Uniforms tab you can sort by Scrapper, Tactician, Blaster, Bruiser, or Infiltrator. Supplies can be sorted by Offense, Healing, and Defense. And lastly, Resources can be sorted by Iso-8 color. This is one of the many smaller updates going into the Season 2 patch that make it a fresh new experience all around. We know everyone has been waiting a long time for Season 2, and we ask that you be patient for just a little longer. Because of the size of this patch, the code is very complicated and we really have to make sure it’s all working correctly before we let everyone play. In the end, we know the gameplay is really fun, and we think it will be worth the wait. We don’t have any more planned releases before Season 2, so hang tight and you’ll be playing before you know it. Not a lot of pictures to post today because this one is about what you’re going to hear in Season 2. As with everything in this update, no stone is being left unturned. The Pre-combat screen and PVP landing page will always feature the same track, while combat and maps will rotate randomly between several selections. 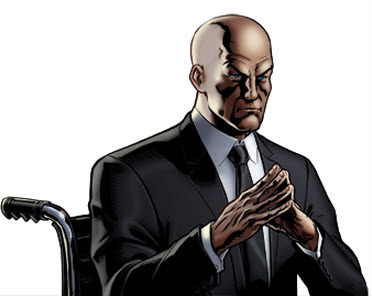 Some of our music may be familiar, as it comes from other Marvel properties. 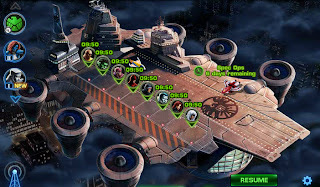 However, none are more notable than one of our new combat tracks - the theme song from The Avengers! When we heard this for the first time last May, we knew we had to find a way to get it into the game. Season 2 provided us the perfect vehicle to update the sound for the whole game. So while it was a long time coming, we hope you enjoy it! Next we have more than tripled our actual combat sound effects! We went through character by character painstakingly creating and defining new sounds for everyone in the game. From Captain America down to the smallest Maggia goon, the game will sound greatly improved. Because we really want you to give the updated sound in the game a listen, when the Season 2 update finally hits on... oh I almost accidentally said the release date there... Well, anyway, when it finally hits everyone’s music and sound will be turned on by default. Please feel free to turn it back off if you need to, but we ask that you at least give it a chance since we put a lot of effort into improving it. Meanwhile one of my (Justin) favorites is the SC Delta test subject punching you with his purple blades. They sound really sci-fi and awesome! There are a lot of other sound improvements too like the loot spins and pointing and clicking everything in the game. Leave your sound on for a bit and just take it all in. Let us know what you think of the sound once it launches. And since I didn’t have any new reveal images today, I’m just going to give you a sneak peek at Chapter 2. Talk to you tomorrow! Yesterday we did a big post about rewards. 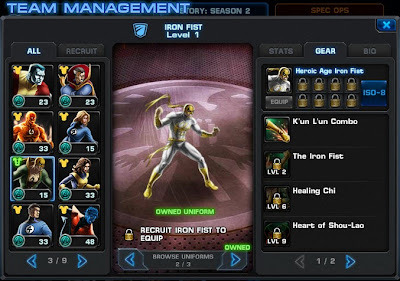 Today I wanted to get you some notes from the design team about Iron Fist’s character update and his new Heroic Age uniform. You probably noticed yesterday that he has some additional skills on the team page. Did everyone notice the little arrows below the character’s skills in yesterday’s reveal? 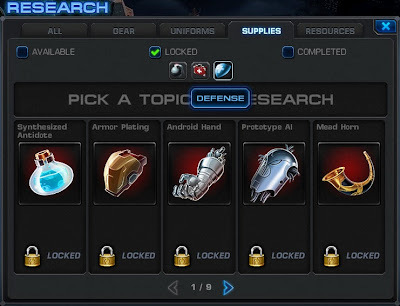 If a particular character or uniform has more than 4 skills (such as Cable, Punisher, and Omega Sentinel) the Team Page will now allow you to scroll through and look at them. Another one of the many smaller updates going into this patch. Pretty neat! 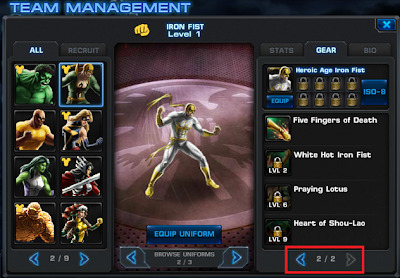 Ok, so why does the Heroic Age Iron Fist have more than 4 skills while the Classic uniform does not? I’ll just post a preview of the patch notes below. Sugar Man isn’t a big fan of the Five Fingers of Death. 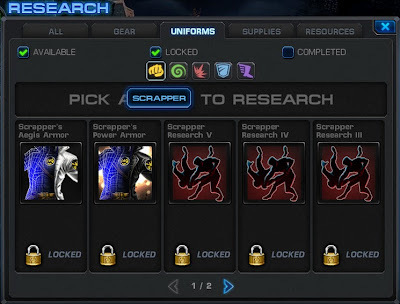 Again, all players who complete Chapter 1 Mastery will receive BOTH the Scrapper and Bruiser versions of this uniform for free! Stay tuned for another update tomorrow as we continue counting down to the release of Season 2: Chapter 1. Today I’d like to talk about rewards in Season 2. More specifically, the rewards you get from pursuing Chapter Mastery in Season 2. The first thing I want to cover here is mission difficulty. 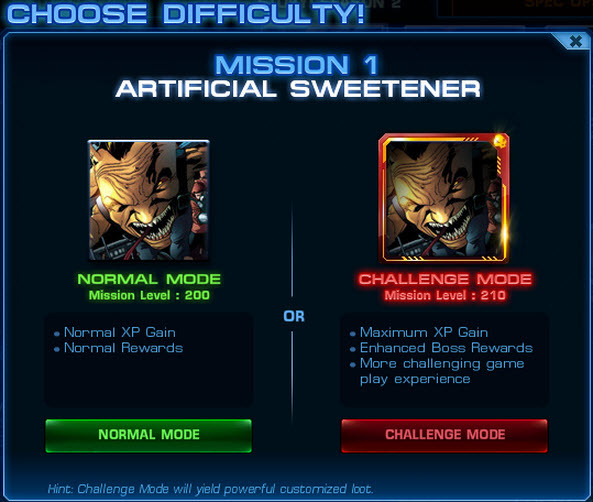 While Challenge Mode remains mostly unchanged (most missions will be 5-10 levels above your current level), we’ve revised how we determine the difficulty of Normal Mode. Remember Challenge Mode is only available after you’ve completed Normal Mode for that mission one time. 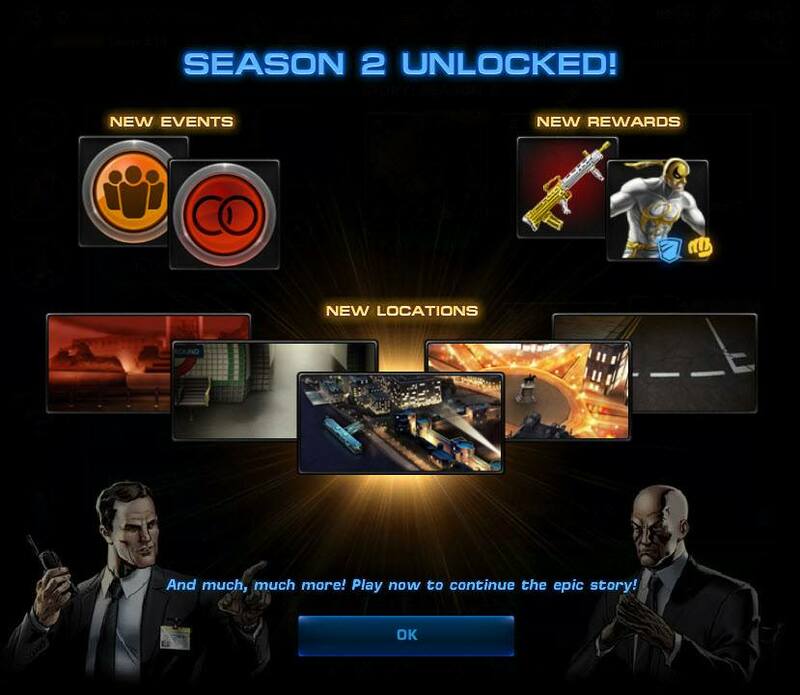 Normal Mode difficulty is set the very first time you attempt a Normal Mode mission in Season 2. This is on a per-mission basis, meaning that if you are level 200 when you do Mission 1, it will be set to level 200 Normal Mode until the end of time. But if you level up a bit doing other stuff and you attempt Mission 2 at level 205, then Mission 1 will still be set at 200, but Mission 2 will be set at 205. 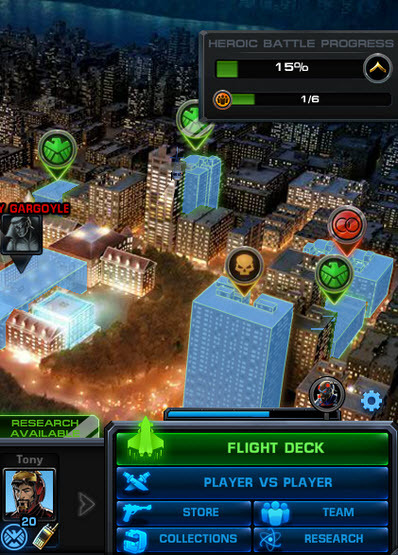 So, in the example image above, you can see that I started Mission 1 when I was level 200. I’m still level 200, so the Challenge Mode is level 210. Challenge Mode will continue to dynamically get harder as I level up, but Normal Mode for me will be 200 on Mission 1 forever, even if I replay the Normal mode at a higher level. None of these changes will affect Season 1 chapters. Ok, you’ve got it. The missions are more challenging. But why? Well, first of all we hear people talk all the time about how they wish the Season missions were more challenging. Second of all we wanted to justify better rewards all around this time. 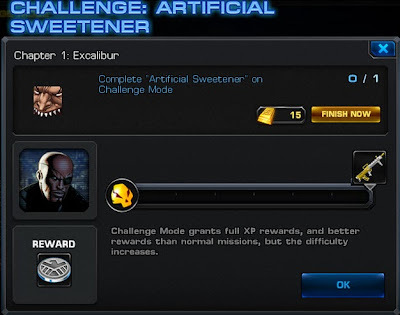 Just as with Season 1, the rewards will get better as you go and Challenge Mode will also offer better rewards. 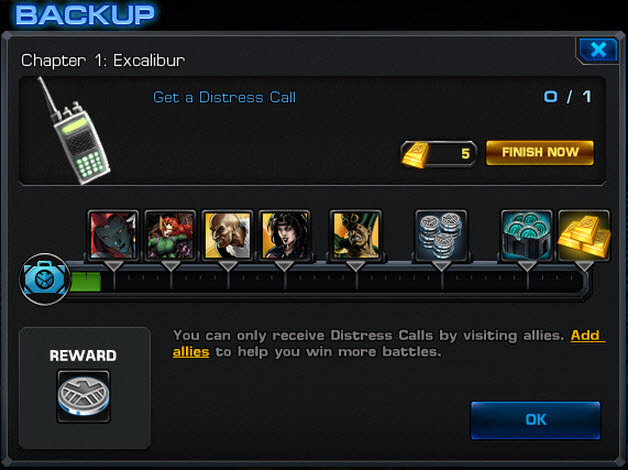 However, since Normal Mode is set to your current level when you start, it will ALSO feature customized rewards now. Rejoice! Above is an example of the very first weapon you receive in Season 2, from Sugar Man (the boss of Mission 1). On the left is the Normal Mode version dropped at Agent Level 200, and on the right is the Challenge Mode version dropped at Agent Level 200. 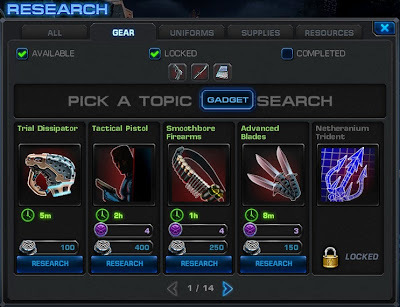 As you can see, the gear in Normal Mode is equivalent to Challenge Mode gear from Season 1, and the Challenge Mode gear in Season 2 is much stronger. So that’s drops - they are better than they were in Season 1 and most of them are Customized. While many drops will be familiar, we want to let you know we are planning to re-evaluate the loot tables between now and Season 2: Chapter 2. More on that in the future. Let’s talk about Tasks now. Recently the task system was greatly overhauled for Covert Tasks. We merged the progress bar concept from Spec Ops with our existing Task system to come up with something new. It was our plan all along to really utilize this with Season 2. As you can see from the image above, you’ll see a Task Bar that resembles the one in Spec Ops. While we won’t reveal right now what all the tasks are (what fun would that be?) 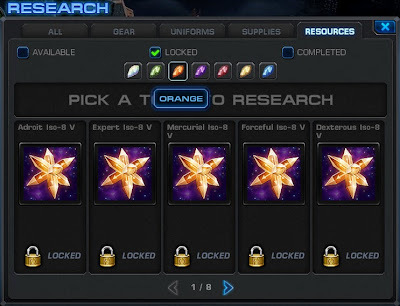 we can talk about those reward icons you see. The first 4 images represent Chapter 1 missions 2-5 (as you’ve probably already figured out). The image of The Living Pharaoh represents unlocking Chapter 2. Unfortunately Chapter 2 will be launched at a later date, but we want players to know where the unlocking point is for it. The next icons represent silver, command points, and gold. What amount? Some surprises are best left for release. Of course there are more tasks than just those represented in the main task chain. 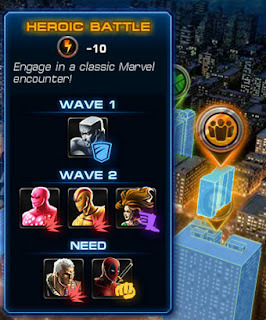 When you start your first Challenge Mode for a particular Chapter, you’ll see a task chain that requires you to complete all the Challenge Modes in that Chapter for a reward. Here’s what I’m talking about for Chapter 1. This is where our Golden Weapons have been relegated to. Let’s move on to Chapter Mastery. When you hover over each of the progress bars for the individual events, you’ll see that completing EACH of them has a reward. For example, If you complete all 7 Incursions in Chapter 1 you’ll receive a pile of gold. A one-time reward for completing all the events of that type. 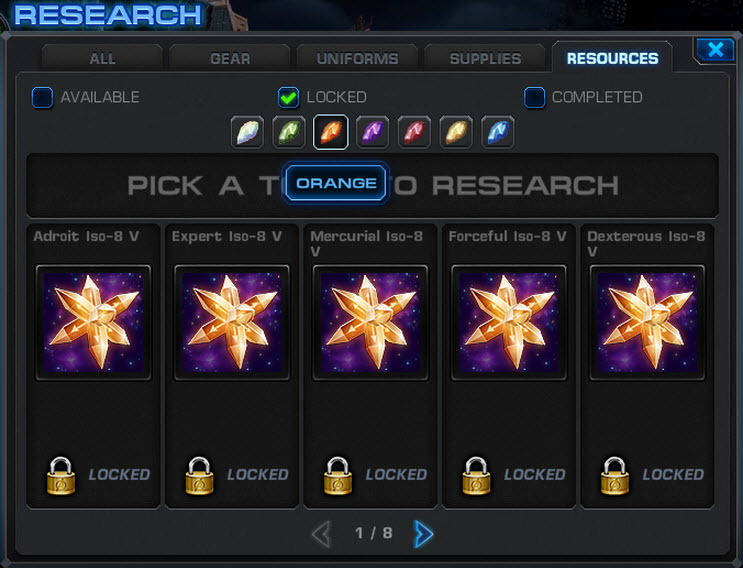 So that’s 7 rewards, right? Wrong. We’re so nice we’re giving you 3 rewards for completing Chapter Mastery. Want to take a look at what all of the rewards are for the entire Chapter in one place? Click the “Chapter Info” button to see the new Chapter Info window. Here’s a sneak peak. Did somebody mention Professor X? 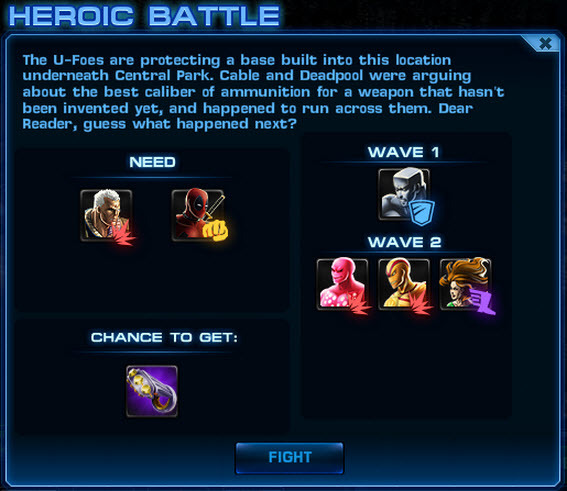 See how Iron Fist shows the Bruiser and Scrapper icons? You get BOTH versions of the Heroic Iron First costume when you complete Chapter Mastery. How sweet is that? 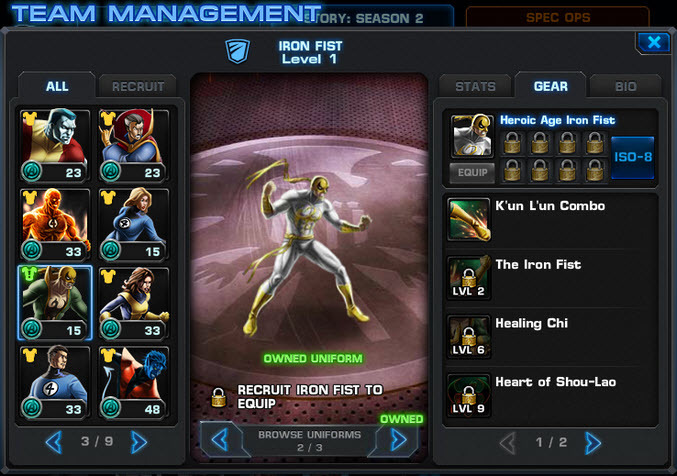 Of course there’s a chance that you don’t own Iron Fist when you complete Chapter Mastery. In that case you will see some new icons that show you that you own a uniform but not the hero it goes to. See the above image for an example. Alright so there is actually ONE more reward that you get for Chapter Mastery. That is the concept of a Season 2 Rank. 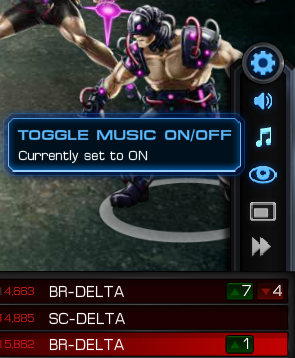 Along with your current Tournament Rank, it will be displayed for all your friends on their neighbor bar. It can also be seen in the “Season 2 Rank” tab of your profile. This tells all of your friends how far you’ve come in your Season 2 quest for glory. As more Chapters are released, the highest possible rank increases (each with a new icon). 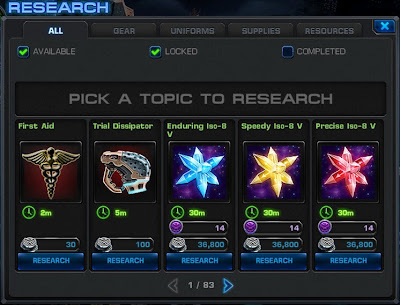 As a reminder this is just a summary of the rewards available in Season 2, and there are many specific items and drops available throughout the Chapters for players who are willing to pursue Chapter Mastery. That’s it for today. Tune in next time for another exciting look at Season 2. Now that you’re up to speed on Incursions, let’s talk about our other brand new event type in Season 2 - Heroic Battles. 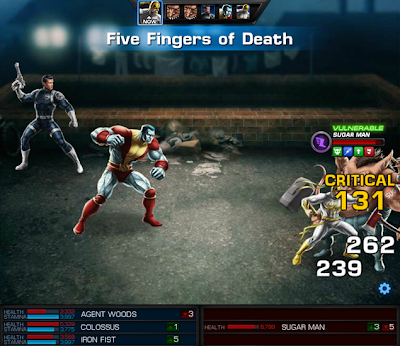 It’s well-documented that a lot of people on the MAA team read Marvel Comics. We all have our own favorite characters, stories, and relationships. However, given that we are pursuing a cohesive narrative in the game (and the larger MGU), we don’t always get to explore these relationships. Enter Heroic Battles. A chance for a hero (or three) to break away from the rest of the group and pursue their own personal business. We’re really excited about that. It gives us a chance to get two or more characters we love in a private setting to really focus on how they interact with each other. You’ll notice the icon we used is one that matches the icon for the “Team” page button. Heroic battles are also more challenging. Not only because the Agent and their items aren’t in these fights, but because we can set and balance the fights to a particular grouping of heroes and make them as tough or as easy as we want. A great example is the Mission 6 Heroic Battle - Cable & Deadpool vs. The U-Foes. All 4 of the U-Foes. Well you know how it is with Deadpool around. I don’t want to ruin the entire conversation for you, but here’s a taste. 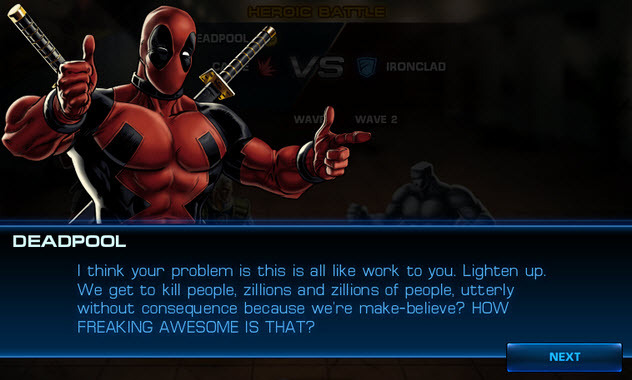 Alright, so then you jump in the battle with Cable & Deadpool against Ironclad, Vector, Vapor, and X-Ray. Punching and slicing and shooting. With the win I’ve completed my first Heroic Battle of Chapter 1 and with my other accomplishments (such as deploys and tasks) I am 15% finished with Chapter 1 Mastery. I recommend you level these heroes up if you want to win. If not, you’ll die, but that’s ok. Why? 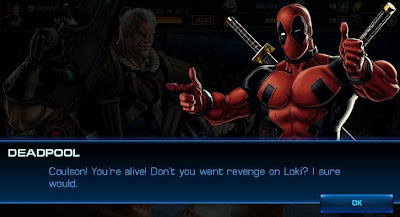 Because there is a ton of awesome unique dialogue written for each battle in the case you lose. So maybe you’ll be like me and you’ll actually want to lose each of these fights once to see all the dialogue. 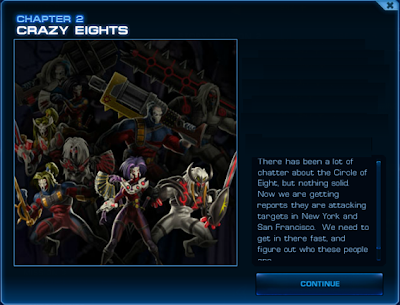 In Chapter 1 there are 6 Heroic Battles (one in each Mission). If you’ve been paying attention, we’ve revealed a few of them already. They were Cable & Deadpool vs. the U-Foes, Gambit & Rogue vs. Prime Sentinels, and Wolverine vs. Sabretooth. You’ll just have to play Season 2 to see the other 3! So that’s Heroic Battles in a nutshell. 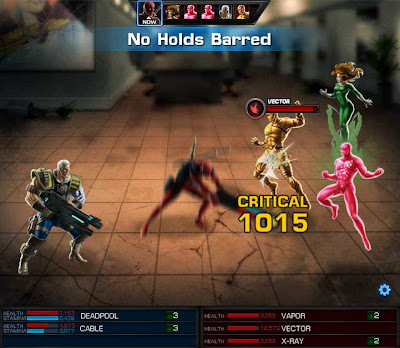 Dialogue-focused, character-rich combat experiences that will make fans of the comics and films ecstatic whether they win or lose.